"The best way to do nothing well is to make sure to do it slowly." 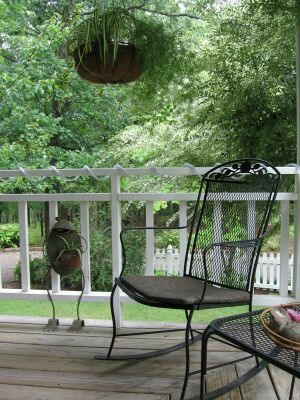 Mountain Thyme is proud to announce the establishment of Local 213 of the Professional Porch Sitters Union, effective September 29, 2007. 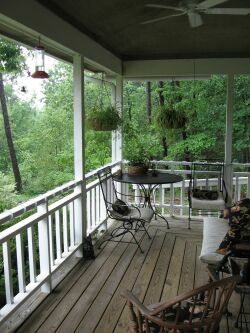 Actually, we were pretty well established in 1998 when we got the swing and all the chairs and tables put on the porch. 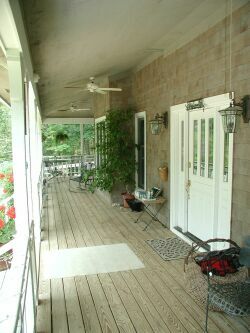 But we only found out about PPSU from a guest in Sept 2007 while sitting around on the porch talking. So, we&apos;ve finally gotten around to joining. We will be notifying the PPSU World Headquarters in Louisville, Kentucky of the establishment of Local 213 as soon as we can get around to it. Or not. Local 213 will be formally adopting the official Union Rules listed below at our first formal meeting, which we won't get around to having, after a suitable period of debate by our registered membership which we definitely don't have. But we will be more than happy to talk about it to any potential members ... if it comes up. Local 213 has hosted countless discussions about the really important issues of our day. Can one hummingbird really keep all the others from feeding at "his" feeder? 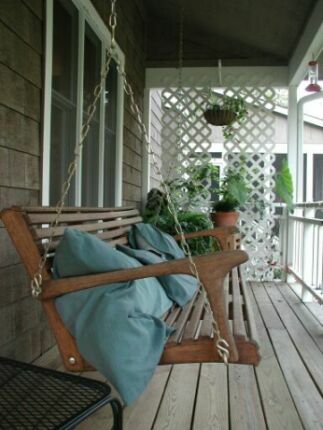 Is it more relaxing to rock in the rocking chair or to swing in the swing? Why does it take more energy to argue about who will go get more lemonade than it does to just get up and go get it? Is it cheaper to pay more less often, or to pay less more often? Is a kid really smart or really dumb to always pick the nickle from grandpa&apos;s hand instead of the dime because the nickle is bigger? Since placebos rate second place in almost every medical trial, why doesn't insurance cover them? They are almost as good, and they are apparently used for a much, much wider range of problems! but no one was taking notes. "Sit down a spell. That can wait." by any member at any time. "The secret of success in conversation is to be able to disagree without being disagreeable"